Enjoy these geeky drinking games with your nerdy friends. Livers beware. Drinking games are often acknowledged as something of a dangerous pastime, as many of them can absolutely wreck you. You may wake up hung-over and bleary eyed. You will be unable to remember your own name as you slaughter countless brain cells for fun. While the stereotypical drinking game tends to be associated with frat parties, fear not, nerds and geeks. There are drinking games designed specifically with you in mind, too! For those of you in search of geeky drinking games to enjoy with your nerdy friends, you will be glad to know that there remains a cornucopia of games that can give you irreparable liver damage. This classic film has entertained people since its inception. However, there is one way to improve the movie: the drinking game that comes with it. And don't worry. The rules are simple. When the characters drink, you drink. And you drink what they drink. So yes, get your beers and White Russians ready, because you're going to be having quite a few of them by the time the credits roll. This variation on the popular game requires you to each have ten cups, with the tenth cup serving as the "Golden Snitch" to shoot at the end. Set up three huge hoops to throw the ball into. The game incorporates a series of point values. You lose ten points if you cheat, but gain ten if you toss your ball in a cup, ask for some Felix Felicius (a straight liquor shot), or twenty points if you make a shot through the hoops (which can then be swatted aside by the "bludgers" (opponent's hands), make a bounce shot, or get three in a row. These are just a few of the rules. The link above brings you to the more complex system of rules that make this game far more elaborate than your usual game of beer pong. This variation of Smash Bros is guaranteed to get you... smashed. It can work with essentially any version of Smash Bros, be it original, Melee, Brawl, or Wii U/3DS. Every player gets a beer--as well as some extra liquor. Start a stock match of Smash (preferably no more than five lives, for safety purposes). Every time you lose a life, take a two-second drink of beer. If you lose all your lives, you need to take that two-second drink whenever someone else dies. If someone over 150 damage kills you, drink half of your beer. Over 200? All of your beer. If a CPU kills you? Half of your beer. After the round ends, whoever is in fourth place does a shot. Repeat as many times as needed until you are too drunk to know how to hold a controller. Did you know that everyone loves Bill Nye? Well, of course you did. But, with this nifty home experiment, you can return to the mindset of your younger self by killing half of your brain cells with booze. Consider the following. There are numerous cues and mannerisms of Bill Nye and his show that you will be drinking to. The list of cues is long and complicated. Many may not be relevant for every episode, and it may be wiser - and safer - if you only apply a few of the rules (while wearing your pair of safety goggles). This popular board game will put your liver and body to the test. 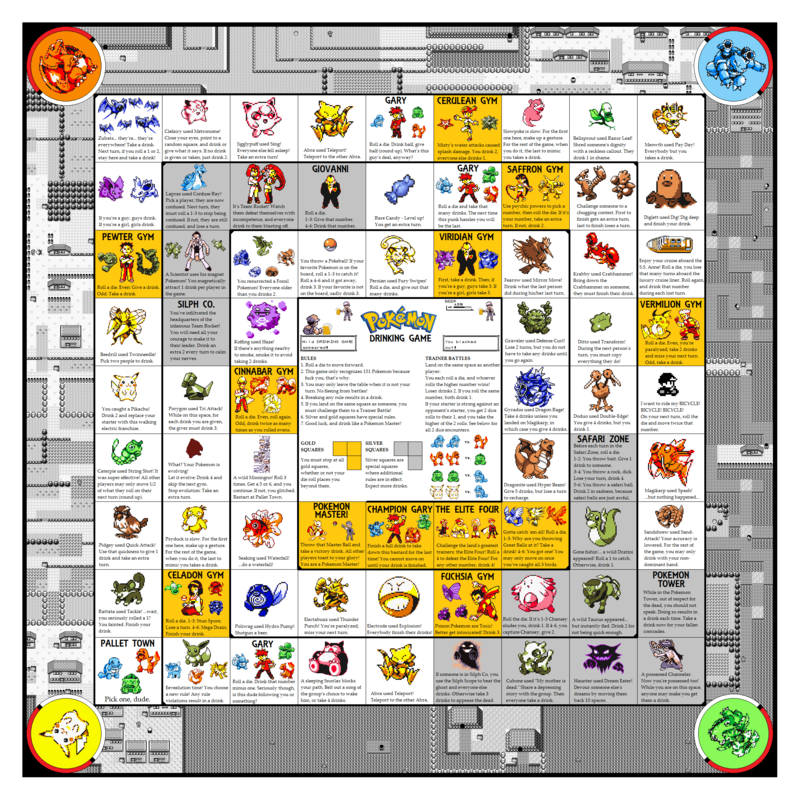 This game takes you throughout the world of Kanto, where the original Pokemon Red and Blue took place. You roll the dice, land on a special space, and follow the instructions. Simple in theory. Hard in practice. The game can take minutes or hours, depending on your luck. Some spaces may require you to drink if you make a sound, make everyone else drink, or, toward the end of the game, go back to the very beginning. I advise you to read every space to get a feel for what sort of challenges await you on the road to the Indigo Plateau. Inspired by the Pokemon Drinking Game, this game inspired by Ocarina of Time will test your mantle with this triangular board. Each space has instructions you must follow in order to proceed. Instructions are given, odd orders are issued. Unlike the Pokemon game, however, there are a few other humiliating elements, like stripping down, hiding your head in shame, and even playing the game with your eyes close. If you can handle a game that may break your emotional fortitude, then play this hard game. And follow the rules! You better do what the instructions say. This game is simple, but will probably also kill you in twenty minutes or less. All you need to do is drink whenever the words "friendship," "friends," "duel," or "Yugi!" Continually drink beer if the characters are literally recounting something that had just happened on screen moments before. Take a shot if a dragon appears on-screen as a bonus rule if you really don't want to see the end credits come up. Or anything else. Perhaps the most famous of all video game related drinking games, this infamous game requires you to break the rule about drinking and driving. To play, get Mario Kart (any) and a beer. Your objective: finish the beer before you finish the race. But wait, before you say that's easy, there's a catch. Your kart can't be moving while you're drinking. You have to finish the race with an empty beer, or else! If you hate your friends, you could add the rule that the loser needs to take a shot... and, if you're in dead last, even behind the CPU, you take a double. AND that you can't finish your beer before the end of the first lap, to keep them from chugging while waiting for the race to start. Hard mode? After a few rounds of this, do Rainbow Road. GTA is one of the most popular video games of all time, but did you know there is a drinking game that makes this game a little more... competitive? Gather a collection of friends. One player takes the controller. From here, the player has thirty seconds to get a wanted star. If he or she fails, then they must accept the penalty of a straight shot. From here, the game begins. For every star the player gains, everyone else takes a sip. For every start the player loses, the player drinks. If the player can escape the cops, everyone else must finish their drinks. If the player is killed or arrested, the player must finish his or her drink, then hand off the controller. Continue as long as you can. Dark Souls is hard, and so is this game. Same as the GTA game, the rules are simple. You trade controllers around with friends. Seems easy, right? When you die, you take a shot. Pass the controller on, and proceed. If you die from an environmental factor, take two shots. If you fail to recover your souls, take two shots on top of the other shots you're taking for dying early. If you kill a boss, then everyone else must take a shot. And yes, I mean shots. And something strong. Dark Souls has no mercy. Upset by the rules? Well, get good. You play until the sweet release of death frees you. Your Gods have forsaken you to your fates. Body positive blogger, freelance sculpture, self-proclaimed connoisseur of whiskey, and forever in search of a hamburger as delicious as the ones you see in food commercials. Wendy's just doesn’t cut it.